InProcess celebrates the premiere of Fondamentus® yesterday in Rangoon in Burma. A fantastic cultural and artistic experience in mythical places, Fondamentus® embodies the values ​​of elegance, excellence, respect for History, energy, optimism and joy of the creative act: they are ferments of innovation! Designers are born-entrepreneurs. Who are unaware of that. Christophe Rebours publishes today on his blog an analyze on the entrepreneurial nature of the designers. He outlines the specific added values of designers and entrepreneurs. He states that: “Companies have everything to gain in considering “intrapreneurs” who are designers or who come from the culture of design, to help them create a new, accurate and successful company model, which is as close as possible to its users-citizens! 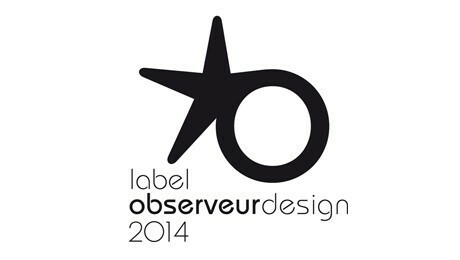 For the 1st time, InProcess enters the Observeur du design on the jury side! Christophe Rebours is invited to sit in the prestigious jury under the presidency of Paul-François Fournier, Executif Director of the Innovation Division of Bpifrance. Join them on November 28, 2013 at the Cité des sciences et de l’industrie in Paris for the Étoiles de l’Observeur du design 2014 award ceremony! The exhibition will be open from November 29 to March 23, 2014. Under the Honorary Presidency of HRH King Norodom SIHAMONI and in the presence of AUNG SAN SUU KYI, Fondamentus will bring together the Ministers of Culture and Foreign Affairs of the 30 countries of the International Co-ordinating Committee for the Safeguarding and Development of the Historic Site of Angkor, on the occasion of its 20th anniversary in December 2013. The Royal Ballet of Cambodia, the Myanmar National Symphony Orchestra and the French quartet Des Equilibres will play and dance together on the music of composer Odile Perceau, Handel and Bach. 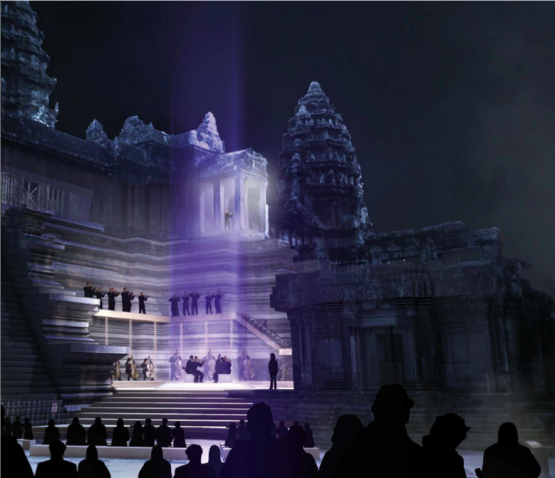 In the Cambodian night, a sensitive scenography will enlighten the bas-reliefs of Angkor’s most sacred shrine and will awaken its apsaras of stone. The event will also be given in Rangoon and Mandalay in Burma. A sensitive material, the light is a great vehicle for smooth communication, and to support non-intrusive messages. Thanks to the Khloros Concert, InProcess has the great privilege to highlight the sacred Angkor Wat and celebrate the 20th anniversary of its protection by the international community. - A sacred place, Angkor Wat will open nightly for the first and only time in its history. - The Royal Ballet of Cambodia, inducted into the UNESCO Intangible Heritage List and directed by Princess Buppha Devi, will dance for the first time ever on a Western classical music. - The Myanmar National Symphony Orchestra will travel abroad to play a classical repertoire, for the first time since its inception. All details on this historic event will be revealed by Odile Perceau on the Fondamentus launch conference on 3 October in Paris (by invitation only). 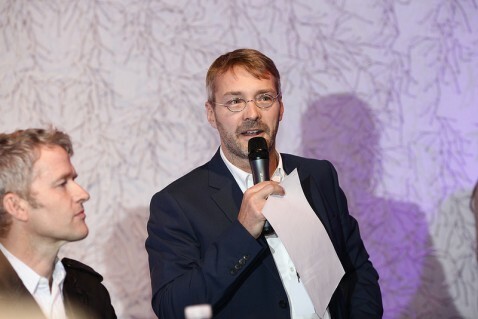 Christophe Rebours to facilitate the Women’s Forum’s Brainstorm Hub on creativity. The 9th Edition of the Women’s Forum Global Meeting will be held 16-17-18 October 2013 in Deauville with the theme “The open world: Compete, cooperate, create”. It will ask how we can better marshal competition, cooperation and creativity to our mutual benefit. Creativity is celebrated this year in The Discovery, the Women’s Forum “off program,” with a complementary program that asks What does creativity mean to you? Creativity is linked to business innovation and social entrepreneurship. Personal creativity shifts as people age and as digital forms of expression expand. Can the design be an influential tool to serve great causes and governments? Daniel Kahneman (Nobel Laureate in 2002) proved it: human behaviors are not only rational, they are also emotional. How to predict them? Governments today invite psychologists, economists and designers at the heart of the power to build new devices of influence. Christophe Rebours will debate with students from Dauphine University on the ideal way to bring together designers and marketing and communication professionals to invent new ways to positively influence issues of general interest. Christophe Rebours participates to the Designer’s Days at the “reverse” round table designed by Brigitte Borja de Mozota. Students will question the future of design schools in front of experts around three topics: imagine (the school as incubator and entrepreneur) – imaging (the school as laboratory of research and of measurement of emotions and sensory) – “imaginalizing” (the school as a space of innovation and societal transformation). - The consumer is dead, long live the individual! - The purpose of the next marketing: marry performance and ethics. These 4 convictions are the result of the extensive project initiated in early 2012 by the Adetem Scientific Committee (which Christophe Rebours proudly contributes to) and involving a hundred of Adetem members. It ends today with the publication of the Manifesto for the Marketing of tomorrow, to download for free. Its future now is in the hands of marketers, whether or not members of the association: let’s react and enrich the discussions in order to publish a joint publication in November, during the 13th National Day of Marketing in Paris. Dragon Rouge and InProcess today announced that Dragon Rouge sold to InProcess the 50% of the InProcess’ share capital held so far by Dragon Rouge. After this operation, Christophe Rebours, founder and CEO of InProcess, becomes the only shareholder of InProcess. This assignment gives InProcess all strategic and operational means to assert its position as the leading agency for innovation by the experience and the usage in Europe, and to pursue its international growth (in China and the U.S. in particular). She asked Christophe Rebours who stated that there are many things that we cannot explain as consumers, but ethnologists at research institutes like InProcess Research have that ability to capture this missing information by observation. They provide companies with advanced knowledge about behaviors and practices that are all paths for new product offerings and services. A free translation of the article’s excerpts by InProcess.